You are absolutely correct about bias. If we can acknowledge our bias, then we can move from our perch of comfort and security to explore all areas of customer knowledge and understanding to reach the star. I’m worried that folks are taking CustDev as its own religion and setting themselves up against the other groups and splintering into camps that say…”this way to #CustDev” is better when all that really matters is revenue. How much revenue have you brought in lately? How are you helping develop a dependable and repeatable revenue cycle as fast as possible? 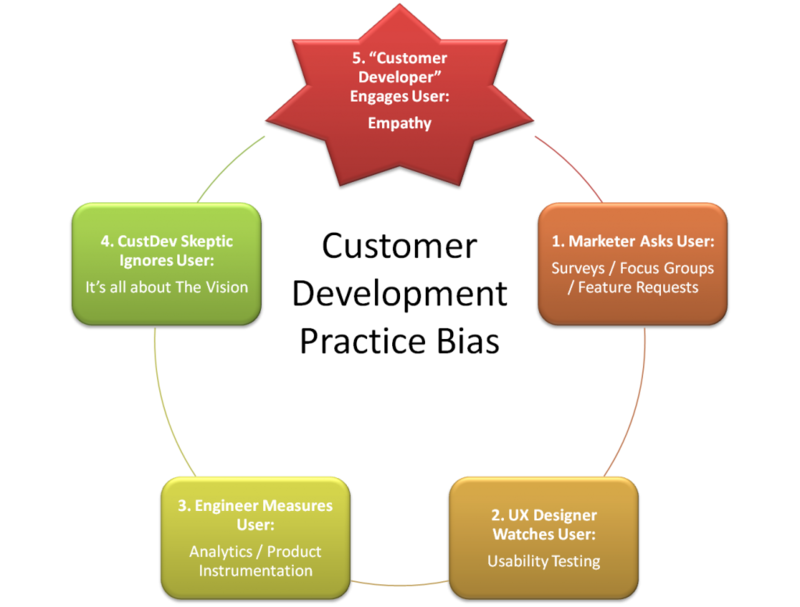 UX is more than usability testing. What about ethnographic interviews? Aren’t they all about developing empathy? A big piece missing in a lot of UX today is data. Not just 30 data points–which, btw, doesn’t work when you’re dealing w/ people (see: http://www.jedcampbell.com/?p=262#comment-3866), but statistically significant data. What if the process of better understanding your users, what they want and need and what matters to them (and how much!) could be better explained not just by sharing the results of your most recent focus group, but through a mechanism that allowed you to say, with some level of (statistical?) confidence that you users really want x over y and b over c? Wouldn’t that make UX better? Wouldn’t that make product management and development better?